Commercial properties, including businesses and apartments, generatenearly three-fourths of the 40 million tons of solid waste disposedannually in the State, and much of this waste from the commercial sectoris readily recyclable. The current overall recycling rate for businesses in Elk Grove is 47.7%. We need to, and we can, do better. 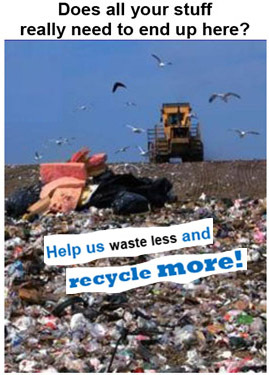 The City is required by State Law (AB 939) to recycle 50% of its waste, with a goal of 75% by the year 2020 (AB 341). Additionally, AB 341 mandates recycling at all commercial properties that generate four cubic yards or more of solid waste per week and at all multi-family residential dwellings with five or more units. 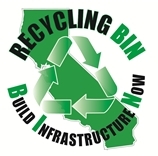 Join The BIN Coalition: Build Infrastructure Now! Join the statewide effort to build additional recycling marketdevelopment infrastructure in California and to reach for an alternativeto the current export of 80% or more of recyclables to offshoremarkets.